Get Your Talking Points Ready: The Political Machine 2016 is Coming on February 4th! Out Talk, Out Smart, and Out Spend your Opponents as you Race for the White House! Get The Political Machine 2016 on February 4th! If you've ever watched the U.S. elections and thought to yourself, "Even I can do better than that!" -- well, this is the game for you! Take to the campaign trail and win the hearts and minds of America's voters to take your place in the White House in The Political Machine 2016. With over a dozen candidates and dozens of national issues to contend with, you'll need to use your wits (and your cash) to convince the nation that you're the right person for the job. 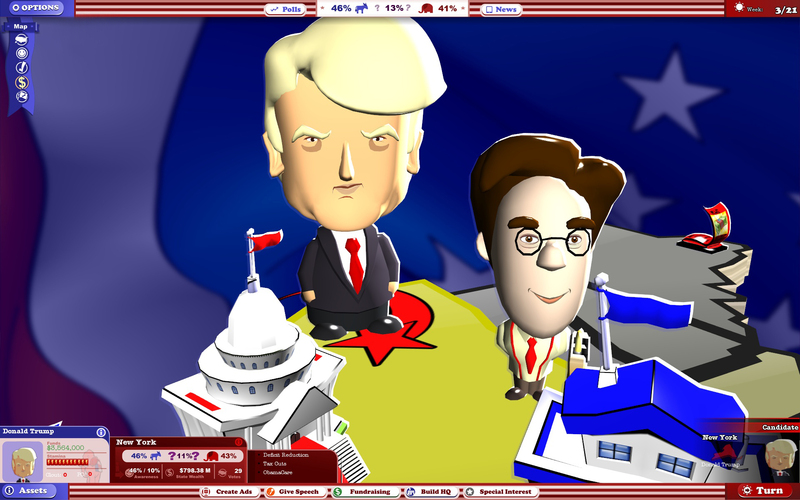 If you don't think any of the candidates provided are up to the task of the presidency, you can create your own custom front-runner complete with your own unique avatar, political party, and hometown. Turn friends into frenemies in multiplayer mode, where the two of you can face off against each other in a campaign to end all campaigns. Buy ads to talk up your issues or tear down your opponent, ace your talk show interviews, and travel across the United States to win those electoral votes! The Political Machine 2016 Releases on February 4, 2016. Purchase it on Steam here or check out our website for more information!